Jing Zhang, president of the Bangor Chinese School, and Bangor City Council Chairman Nelson Durgin, unveil a monument recognizing the sister-city relationship between Bangor and Harbin, China on Monday, July 15, at the Bangor Waterfront. BANGOR, Maine — City officials and local Chinese-American community members unveiled a new monument on the Bangor Waterfront Monday morning to recognize the sister city relationship between the Queen City and Harbin, China. Harbin, often called “Ice City” because of its bitterly cold winters and ice sculpture festivals, is located at the northeastern tip of China. Nearly 6 million people live in the city’s urban area, which, like the Greater Bangor Area, serves as a cultural, economic and educational hub for the region. 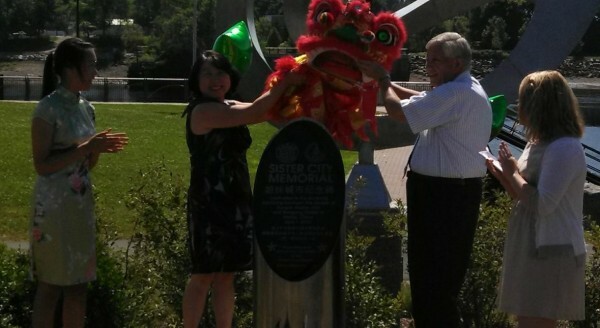 “This monument signals a new start for us to do more, to work toward building our relationship,” including promoting more trade, cultural exchanges and tourism, said Jing Zhang of the Chinese Learning and Culture Center in Bangor after she helped City Council Chairman Nelson Durgin pull a red dragon’s head off the new monument. The relationship between the two cities was formed in 2010, when Zhang and former City Council Chairman Gerry Palmer decided to tie the communities and cultures together as the United States and China continue to forge bonds. Maine political delegates, including Gov. Paul LePage, have made several trips to China in recent years to swap ideas on trade and education. Maine officials have increasingly looked at China as a valuable trade partner. Maine high schools are drawing more students from China each year, as the pool of students to draw from at home dwindles because of an aging population. Tim Lo, executive director of Bangor’s Kahbang music festival, said the monument was a “symbol of Bangor’s international reach” and a “welcome sign” for the Chinese community. Lo’s parents emigrated from China in the late 1970s, he said. The monument and installation cost about $5,000, according to Palmer, and was funded through several sources, including the Bangor Chinese School and The Chinese Language and Culture Center of Maine. No city funds were used, he said. Several area middle and high school students attended Monday’s unveiling, some of them are traveling to China Tuesday for a three-week immersion into the country’s language and culture. They’ll be touring Harbin, as well as Beijing, during their trip, they said. Abigail Jones, a 15-year-old John Bapst Memorial High School student, said the trip would be a “very intense language study.” She’s been learning Chinese for about 6 years and has visited China five times. She said she believed the monument on Bangor’s waterfront would be a signal to Chinese tourists and immigrants that they’re welcome in the community, and it would acknowledge and encourage the Chinese-American community that’s already here. Zhang said there would be great value in the future for young Mainers to know Chinese, as the the nation continues to gain a footing in global business and politics.